The Hook Kids on Fishing Programs at the Old Florida Outdoor Festival on February 13 and 14 were a huge success as 25 volunteers conducted two Hook Kids on Fishing Programs, one on Saturday and one on Sunday, with a total of 180 kids and their parents in attendance. Thanks to AFC Orlando volunteers and sponsors each child walked away with a brand new fishing rod, reel and tackle box provided by the Fish Florida Foundation after completing all five learning stations. In conjunction with the HKOF Program, donation checks from the AFC Orlando Chapter were presented to two Central Florida youth fishing programs. Teen Sportsfishing association and the Seminole Teen Anglers received a total of 3000.00 from profits generated by the Central Florida Gumbo Wars Fund Raiser. As a member of the AFC Orlando Chapter, I’m extremely proud of all of our volunteers and and program supporters for once again stepping up to promote responsible angling in Florida. Great fun was had by all, and I’m looking forward to our next event on March 19 th and the Johns Lake Conservation Area in Winter Garden. Do you remember your first fishing rod and reel and the person who took time out of their lives to share their passion for fishing with you? I do, and if you are like me it is time to pay it forward by joining us, Anglers for Conservation Orlando Chapter, and help us teach kids and their parents to fish. In 2015, AFC Orlando introduced over 900 kids to fishing through our Hook Kids on Fishing Program and at the end of the event, each child took a brand new rod and reel home to keep. 2016 is shaping up to be the same, and volunteers are always needed. Listed below is our 2016 program schedule, so please pick at least one day, and help keep our fishing legacy alive. The more time we spend on the water stretching line, the more passionate we become about fishing and the resources we love so much. Well if you are like me, you understand the value of our fisheries and the need to get more educated and passionate anglers on the water. 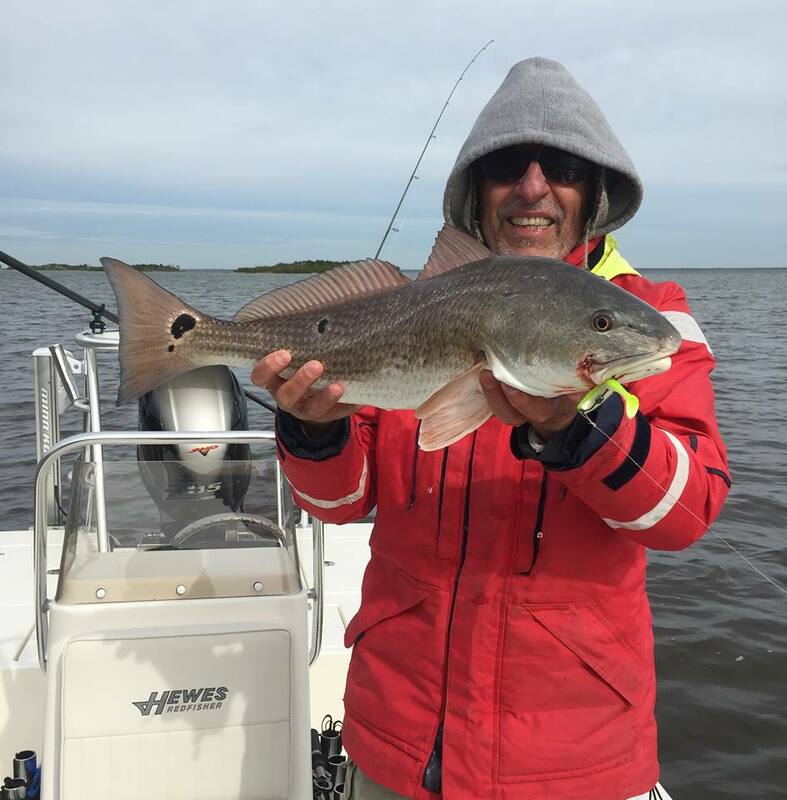 As usual, winter fishing conditions here in Central Florida have held the upper hand when it comes to angling success this past week. Cloudy, cold and windy days always make fishing a challenging, but fishing is fishing, catching is catching and both are fun. At least we are not fishing through an ice hole, and I’m still wearing my winter shorts. I would like to begin this week’s fishing report with a shout out to my three new fishing charter, blog and website sponsors. As I transition into the new year I’m excited about the changes occurring within my life in regards to my fishing business both on and off of the water. Like a redfish transitioning from summer to winter feeding patterns, adjustments will need to be made on my part to sooth the hunger, but change is always good as long as we are moving in a positive direction. As many of my fishing report and blog subscribers know, I’ve added this new blog format to my already existing Constant Contact news letter. This addition is an important part in the development and implementation of my new and improved website. For as long as I have been in the outdoor industry I’ve been blessed with quality fishing tackle and equipment sponsors, but in todays modern age of communication I’m also fortunate to fine like minded outdoor industry partners who support my massage and make these communications possible. If you check the rotating sponsor banner on this website you will see Central Florida Marine, Mud Hole Custom Tackle and Hewes Light Tackle Boats have been added. Along with my new website comes a new flats skiff, and that’s where Central Florida Marine and Hewes Boat Company enter into the equation. Currently my 1995 Maverick Master Angler is out of service with a fuel leak under the deck,and both Central Florida Marine and Hewes have assisted me in the acquiring my new new skiff, a 2016 18 Hewes Redfisher, therefore allowing me to continue doing charters with very little interruption in business. Along with the new skiff, Mud Hole Custom Tackle has presented me with a new MHX lightweight push pole. The unique feature of the MHX Push pole is unlike traditional push poles, the MHX comes in 10 sections that are glued together as a kit allowing them to be shipped by UPS Ground making them both adjustable in length and affordable to ship. These transitions will be challenging as I step into the a new era of my angling life, but these changes will allow me to continue my passion of sharing my angling knowledge and experiences with others in hopes of developing successful and responsible anglers. As we welcome the New Year, it is once again time to reflect back on the events and accomplishments of 2015, and to count our many blessings. We are truly blessed to live in Central Florida where angling and spending time on the water are year round endeavors. I am also very thankful for another great year of fishing with my clients and friends on the esteemed waters of the Indian River Lagoon estuary and our central Florida lakes and rivers. Thank you all for a year filled with adventure on the water, and many great memories. Reflecting back on over six decade of fishing in Central Florida, I must confess I’ve been blessed by the countless passions driving my life. Our passions propel us through life like the prop on a boat, pushing us faster and harder in the realization of our goals and accomplishments. Like the distant shoreline and our anticipation of reaching our favorite fishy flat, passion drives our desires, excites us, quenches our thirst and sooths our souls. Compelled by a love beyond explanation, the passions within can please us, or in some cases break our hearts. My passions in life are many, and as I get older and a little wiser, I’ve grown to realize my passions are often driver and shared by others who feel the same and care alike.